© FarmgirlFare.com, where it's okay to cross the line—and Bert only looks like a pudgeball. He runs about 5 miles a day (tracking rabbits and working as a Junior Guard Dog) and is actually all muscle, but when the camera adds 10 pounds and you only weigh 27. . .
Too cute! If that is even possible :-). My thought when looking at the first picture was "Who is going to cross the line first!" I love how the lambs are so trusting of the dogs! 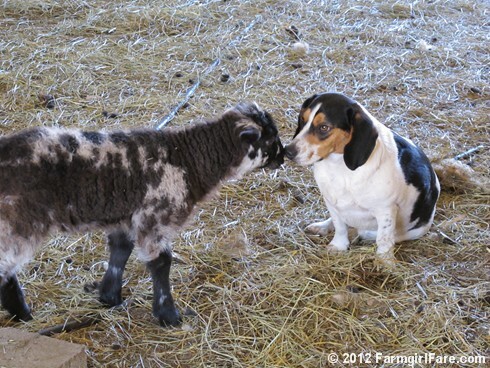 Bert is such a calm Beagle with the lambs. Brave little lamb, too. He is such a sweetie. 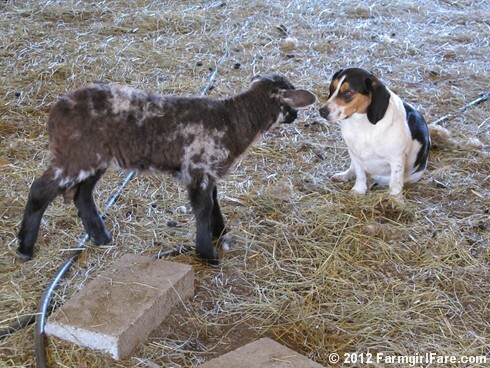 My beagles would be barking in that lambs face. 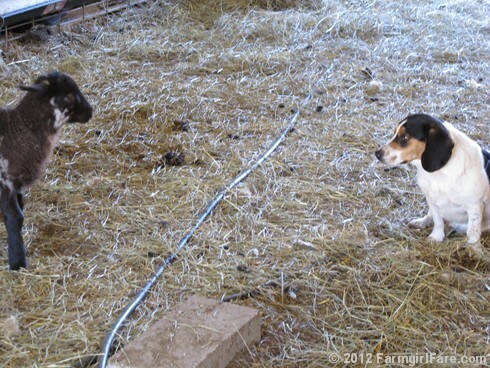 I was wondering if Bert's relationship with the lambs was something he learned from the good example of your other ranch dogs. It doesn't seem like native beagle behavior to me. Sharing a smooch with a cute pooch! Life just doesn't get much better than that!